Aerating is the process of punching small holes all over your lawn. The most effective type of aerating is with a gas-powered machine called a core aerator that pulls out small cores of grass and soil. Other aerators use short spikes to punch holes in the turf. Spiking is not nearly as effective as core aerating, but it’s better than nothing. Aerating does exactly what it sounds like and more. Air is critical to healthy root growth, so it shouldn’t surprise you that aerating is a good thing. 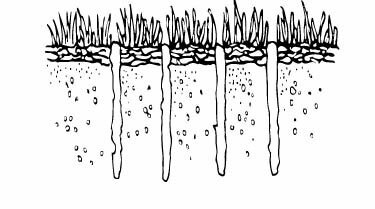 Aerating your lawn breaks through a thatch layer, enables the roots to breathe, and improves water and nutrient penetration. If that’s not enough, aerating helps break down thatch by providing a better habitat for the microorganisms that do those sorts of things. Aerating annually is one of the best things you can do for your lawn, thatch or no thatch. Aerating is not nearly as traumatic as dethatching. You end up with some little cores of soil all over the lawn, but if those really bother you, you can rake them up. If you leave the cores alone, they break down into nothing in a few weeks anyway. So compared to dethatching, which can pulverize a lawn, aerating leaves the lawn in pretty good shape. Consequently, if you have a small thatch problem, aerating once a year probably solves the problem. When you aerate, strive for an even 3- to 4-inch spacing between holes throughout the lawn. To do so, you must make two passes in different directions. Make sure that the soil is slightly moist — not too wet or too dry. Set the aerator to pull out cores about 3 inches long. Years of walking on a lawn or driving heavy equipment on it during construction can compact soil, smashing the particles tightly together and forcing all the air out. You got it: No air, bad for roots. You can identify the compacted areas because that’s where the water always puddles up. Eventually, the grass declines and starts turning brown because the roots receive no air, and water can’t get to them either. Compaction is particularly troublesome where soils are heavy clay. In fact, clay soil can have poor aeration and be slow to absorb water without your help. Walk all over clay soil, especially when soggy, and you really have problems. So what’s the answer for compacted or clay soil? You got it. Aerate. Aerating provides air to the roots and improves water penetration. More air and water mean happier roots and a healthier lawn. If your area has clay soil, you may want to aerate at least once a year. Oh, and one other place where aerating really helps is on sloping ground where water runs off quickly before it can soak in. Aerate, and more water can reach the roots. Is aerating great or what?